This is a classic roundtrip Norway Northern Lights Cruise. You will travel northbound from Bergen to Kirkenes and return back to Bergen. As you turn south on Day 7 you will have an opportunity to visit ports that you passed by at night on your way north. Another great feature of this cruise is that you will be offered a complimentary 5 day summer cruise in case no Northern Lights are reported per ship's log. Our Norway Northern lights cruise starts today. As we make our way north, you will enjoy exciting presentations and activities on board, out on deck or on land. Enjoy the relaxed atmosphere of life on board and meet fellow travelers as you take in the spectacular winter landscapes. We navigate through the coastline further north before reaching the renowned Art Nouveau architecture town of Ålesund. We recommend the excursion to Mount Aksla for a perfect winter panoramic view. Trondheim was Norway’s first capital. The storehouses along the river built on wooden stilts are a colourful contrast to the pure white snow that covers the city during winter. As we cross the Arctic Circle the hunt for the Arctic light begins. This occasion is marked with an Arctic Circle baptism on deck. You have the chance to learn more about the Aurora Borealis and to experience an authentic Lofotr Viking Feast. Later we enter the dramatic and narrow Raftsund. If the weather and ice conditions allow it, we also sail to the entrance of the famous Trollfjord, where you can enjoy freshly made fish cakes on deck. After a morning stop in Finnsnes, we continue to the Arctic capital Tromsø. 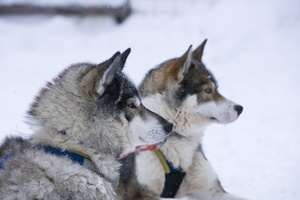 Perhaps take part in a polar dog sledging excursion or a trip to Polaria. As we sail along the coast there is a chance of seeing the Northern Lights. We gather on deck to search for this breathtaking phenomenon. Honningsvåg is the nearest port to the North Cape. An excursion to this breathtaking site puts you at 71° 10’ 21” N, only 2,000 kilometres from the Geographical North Pole. Join the presentation of the Sámi culture and history in pictures, words and music. Later on we pass a rock formationthat is sacred to the Sámi people, Finnkirka. Enjoy the spectacular lighting on this famous rock. At the next port, Kjøllefjord you can join a snowmobile trip to Mehamn, where you might see the Northern Lights on a clear, starlit sky. The turning point of our Coastal Voyage is just 10 kilometres from the Russian border. 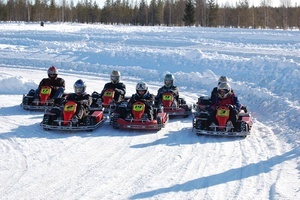 Kirkenes is home to the fantastic Snow Hotel and the base for several exciting excursions, including dog sledging and King Crab fishing. Kirkenes also boasts several fascinating small museums, recounting the history and heritage of this remote frontier. 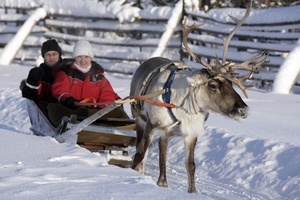 The polar nights extend from 21 November to 21 January. It is not completely dark during this time; the light and colour in the sky are amazing when the weather is favourable. As we turn south the northbound ports visited by night are now visited during the day. In the afternoon the ship docks in Vardø. 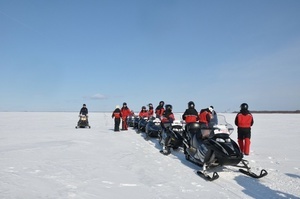 Depending on the weather conditions, we invite you to take an ice-dip in the Arctic Ocean! Before stopping in Hammerfest, you can enjoy an “Energy coffee” and a short introduction to “Melkøya - The northern- most natural gas terminal” on board. Our next major stop will be Tromsø where you have the option to take part in a very special musical experience, the Arctic Cathedral Midnight Concert. Enjoy the stunning views of sheltered bays and glorious mountain landscapes wrapped in the cloak of a polar winter. We stop at Stokmarknes – home to the Hurtigruten Museum, before continuing through the Raftsund, a picturesque and narrow channel between the Vesterålen and Lofoten Islands. As a tribute to the fishing history in Lofoten, our chef shows how to fillet the catch of the day on deck. Enjoy a spectacular winter scenery of the picturesque Helgeland coast with its myriad islets and steep granite walls. As we cross the Arctic Circle again and sail past the famed peaks of the Seven Sisters we enter a world of legend and folklore. Today you have the opportunity to explore the city of Trondheim again. Nidaros Cathedral, where three Queens and seven kings have been crowned, is Scandinavia’s largest medieval building. Later, on our way to kristiansund, you can see the steep, pointed and snow-covered peaks of the Romsdal Alps. Today your journey with Hurtigruten has come to an end, but before we reach the finishing line there are still a few nautical miles of fascinating winter scenery ahead of us. 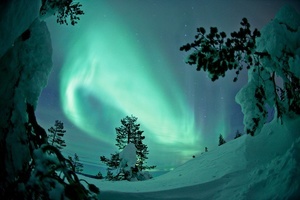 Cross the Arctic Circle and hopefully see the Northern Lights. Explore the gateway to the Arctic, Tromsø. 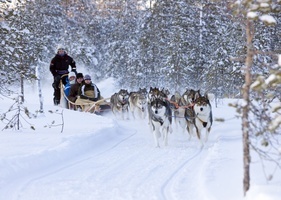 Enjoy a wide selection of exciting and interesting excursions, like the Husky Adventure, Lofotr Viking Feast, dog sledging, Snow Hotel and wilderness Adventure Camp. As a part of our winter program you can enjoy several on board activities and excursions where the Arctic light is the main element. All Norway Coastal voyages that include December 24 will have an additional cruise night. On Christmas Eve, all Hurtigruten ships moor in their respective ports overnight and resume sailing on December 25, giving guests the opportunity to attend Christmas services at local churches and participate in other century-old Christmas activities. Guests are invited to help the crew adorn their vessel and its Christmas tree with decorations made on board, learn Norwegian Christmas carols, decorate gingerbread houses and enjoy a visit from “Julenissen” (Norwegian Father Christmas). Later that evening, passengers and crew members will enjoy a Christmas Eve buffet and eat traditional holiday foods such as “Julegrøt,” a traditional Norwegian Christmas porridge, and the sweet Christmas bread known as “Julekake.” On December 25, a Christmas Day brunch that includes coffee and a cake buffet is held in the ship’s main restaurant. Voyages that take place over New Year’s Eve will have a special celebration with dinner and dancing, and fireworks and a midnight toast to ring in the New Year. Cabin numbers will be pre-assigned to passengers booking The Round Trip, The Norwegian Discovery, or a suite. For The Voyage North a fee of $138 applies, for The Voyage South the fee is $126. The fee is per cabin. Christmas Sailings: All Norway Coastal voyages that include December 24 will have an additional cruise night. All Hurtigruten ships will stay overnight in their respective ports on December 24 and resume sailing on December 25. The rate increase due to the extra cruise night is not reflected in the pricing tables and will be confirmed at the time of booking and included in your invoice.